We invite you to join us for a fully hosted weekend retreat at Titoki Christian Healing Centre in rural Whakatane from Friday, November 23rd - Sunday, November 25th. The retreat will be facilitated by Titoki's own Shirley Hyde. How and why gluten and dairy negatively affects some people, and how we can journey our way to good health in spite of it. Whether full recovery is possible. Both the physical and nutritional aspects of these conditions. Preparing exciting and delicious foods that will help alleviate symptoms and encourage healing. Rachel is very excited to be able to share her ideas with us. She will also do a cooking demonstration to entice our taste buds. During this retreat, there will be times for discussion and sharing of experiences, ideas and recipes. We'll have a session on the importance of relaxation with quick and effective ways to accomplish this. Please bring your favourite GF & DF recipes to share plus helpful tips. Incorporating a GF and/or DF free diet in the western world can be challenging. The idea behind this retreat is to bring us all together to support, laugh and maybe vent our frustrations with like-minded people. Our hope is that you will enjoy a realxing weekend away to recharge and come away with fresh enthusiasm and new friends. What is the format of this retreat? Guests are encouraged to arrive from Friday 5pm in time to settle in their rooms before dinner at 6:00pm. Around 7:30pm on Friday evening we will get together to hear each others stories and learn more about the weekend's theme. On Saturday morning Breakfast is served at 8.30am and we will kick off the first session at 9.30am. The retreat will finish around 11.30am on Sunday after morning tea. Shirley Hyde and her husband Tony came up from Christchurch in 2017 to join the staff here at Titoki Healing Centre. After facing health challenges, Shirley is now gluten and dairy free. This retreat has come out of her journey which she will share during the weekend. Shirley's role here at Titoki is debriefing, counselling and general housekeeping. She's had a lot of experience as a Salvation Army Officer and is a registered nurse. Can you describe the accommodation at Titoki? Titoki’s rooms are warm, comfortable and of of motel quality standard. Some rooms have ensuites, whilst others have shared baths. All have electric blankets through the winter. Meals are homestyle, made from fresh Titoki produce and will be served along with delicious snacks, teas and coffees. Titoki can cater for specific dietery needs. Please let us know at time of booking. The retreat cost is $210 per person for a premium room with ensuite and includes all meals at Titoki. 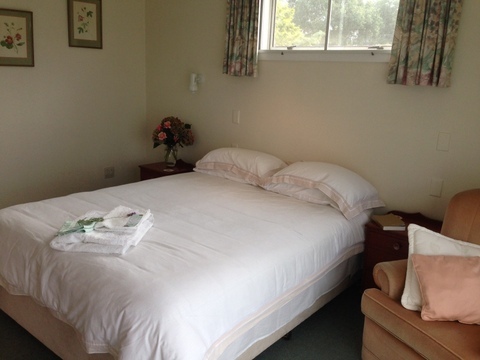 For those who opt for a single-bed room with shared bathroom, the cost is $190. If you'd like to share a room with a friend, we have a two single-bed option for $180 each. Please note that an offering will be taken up during the retreat for the travel costs of our guest speaker. Please contact us at info@titoki.org.nz or 07 308 6503 to make your booking.